Maildir files are the advanced email storage and every email has its individual Maildir file. Maildir Viewer Windows freeware is a trusted utility to view Maildir / Maildir++ files of Thunderbird and Server Sub-Directories in original format. It help in opening and reading Maildir files with Cur, New, and Tmp in sub-directories and Thunderbird in Windows OS. 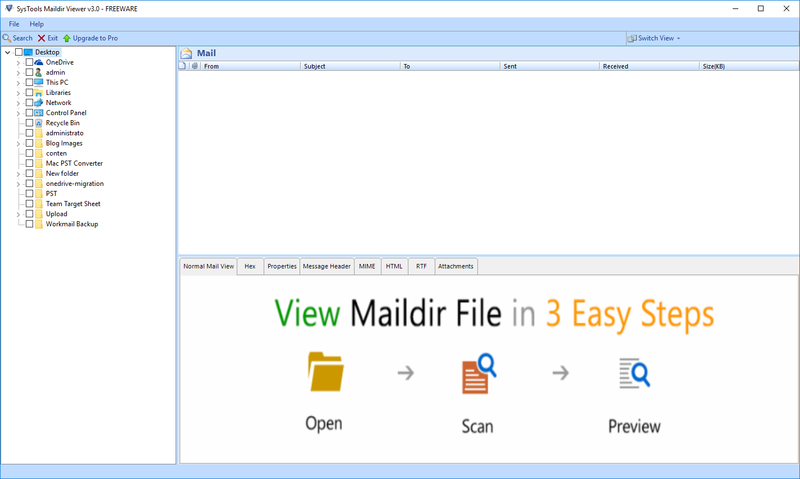 Maildir Viewer Windows applications to open Maildir files can work on all versions of Windows operating system namely windows 10, 8.1, 8, 7, Vista, and below editions. 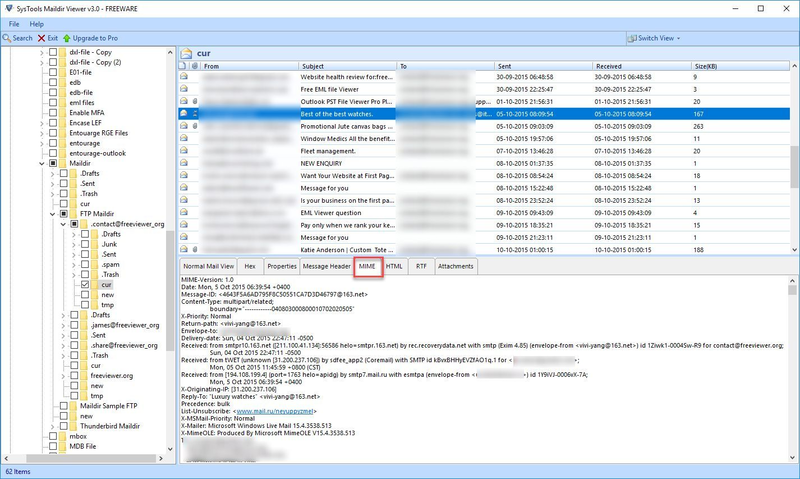 Maildir Viewer Windows software enables users to open and view original message format of Maildir files on Windows 10, 8.1, 8, and its all-prior versions. This tool can help users to open and read Thunderbird Maildir files and Maildir files in sub-directories. The Maildir file like temp, new, and cur of any size is easily supported in this free software. The Maildir Reader freeware gives preview of Maildir Thunderbird file items in different technical manners. 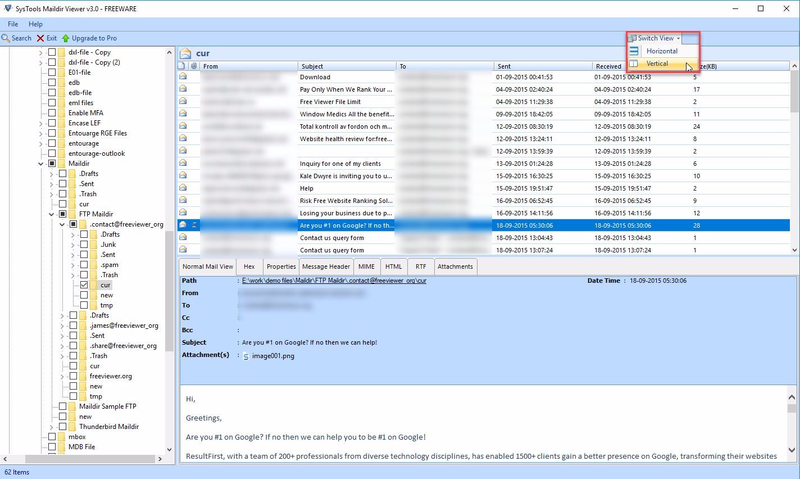 Originally, it displays the normal view of the email messages and after this provides Hex, message header, MIME, HTML, RTF, etc., tab to read email message. This feature is beneficial to forensic investigators to exhibit deep analysis. 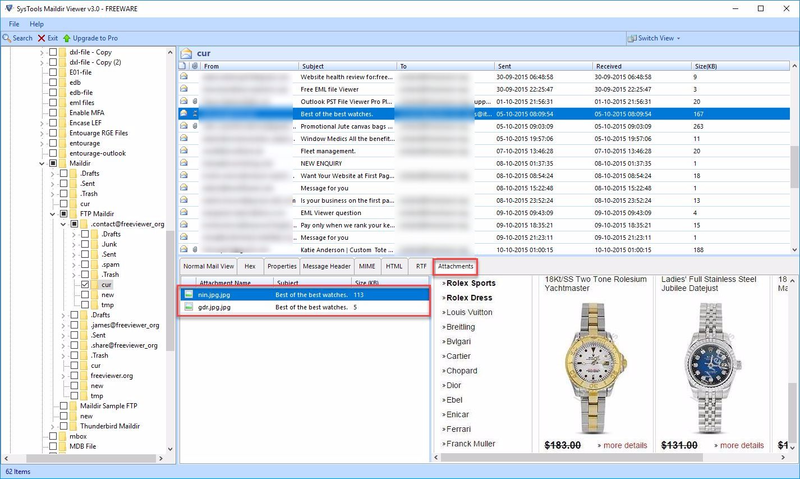 The Maildir Viewer tool provides users a useful functioning of sorting displayed messages upon several criterion. 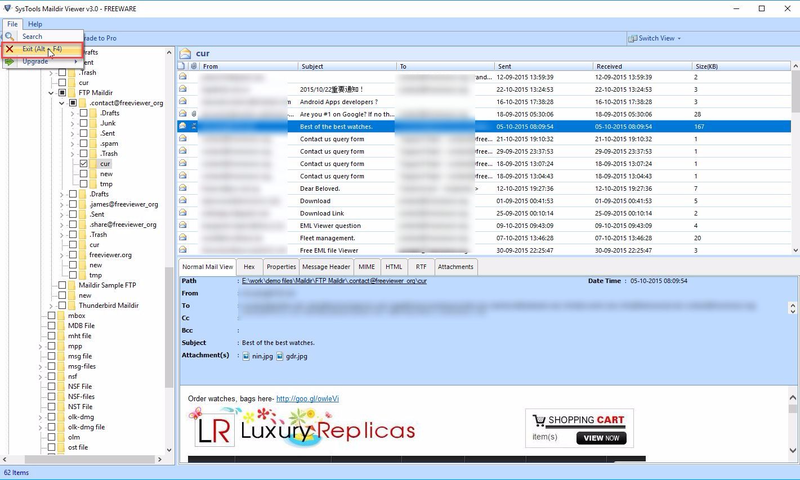 Via this, users can sort items on basis of From, Subject, to, sent date, received date, and size of email message as per their convenience. This equips feature to work with software on user’s comfort. Being the freeware, the product has a feature to open and read Maildir++ files in Mozilla Thunderbird and Server sub-directory in bulk at a time. In addition, a user can add multiple Maildir email files and preview the content with associated attachments and properties. 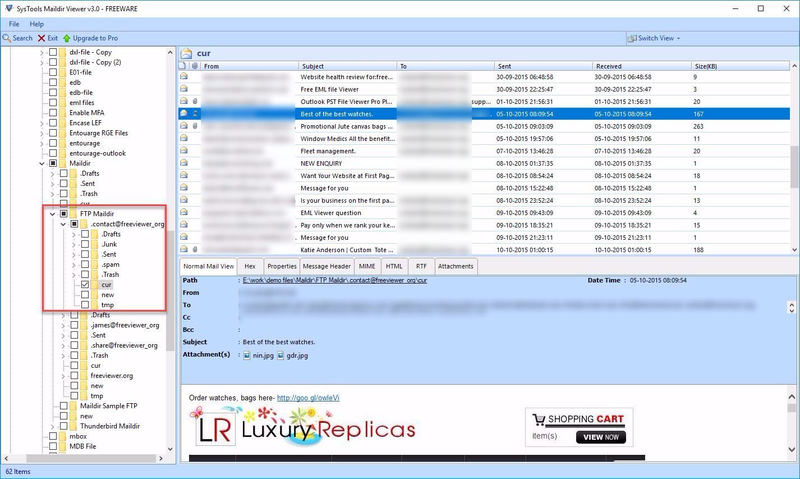 The attachment of each Maildir email will be represented in ‘Attachments’ tab of the Maildir file Viewer software. For using Maildir Viewer Tool, a user does not require any prerequisites software installed on machine. 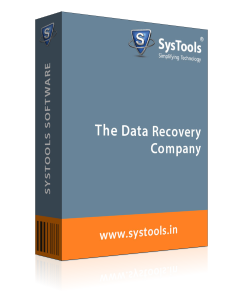 It is portable product, which can easily be downloaded, installed, and executed on all versions of Windows operating system without any additional cost. The software provides an independent solution to open Maildir files in Thunderbird. 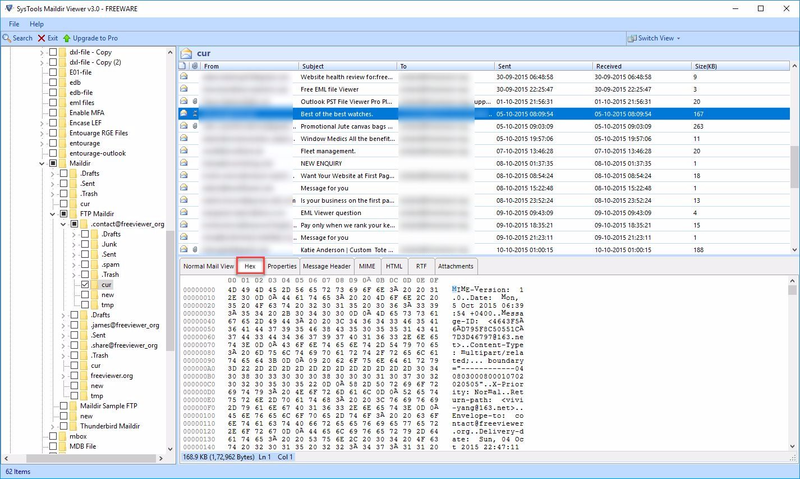 The Maildir Viewer Windows application provides two different modes to view and open Maildir files. According to default settings, the messages are loaded in Horizontal mode and if required then, customers can change the settings into vertical mode. The software has a bilateral interface, which makes it easy to read Maildir format on Windows OS. 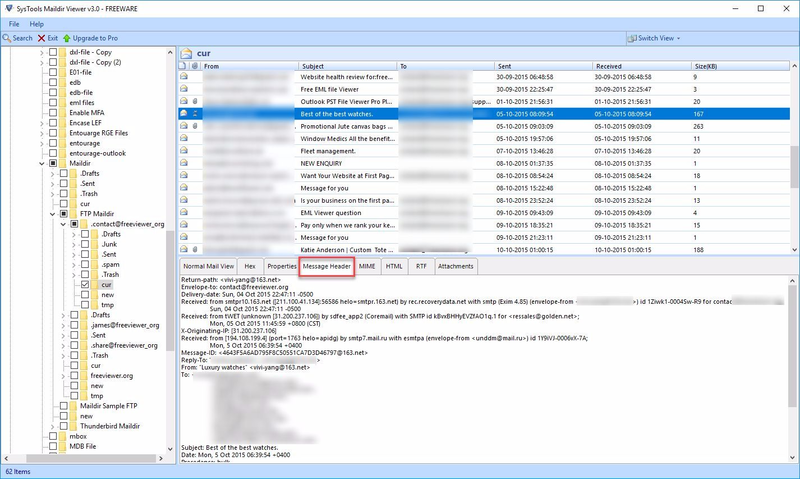 Step 1 : Download and install Maildir Viewer Windows application. When you will open, software the initial Window of Maildir Viewer will be displayed. Step 2 : From the left panel of the window select the folder, which is consist of Maildir files. To preview all the files, you can view on the right panel of the window. Step 3 : Normally, click on the wished email for message previewing. 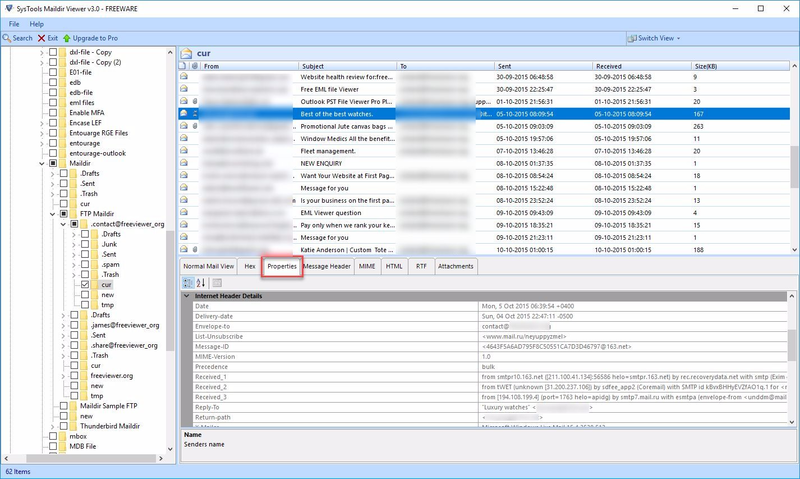 Step 4 : It provides two switching view modes to preview Maildir email files: Horizontal View and Vertical View as per the user’s convenience. Step 5 : Once the scanning gets completed, the software loads the entire Maildir file items and now you can preview it. Click on the items that you need to view in the display panel with multiple view options such as Normal, Hex, Properties, Message Header View, MIME View, RTF and attachments. For normal view of emails, click on Normal Mail View. Step 6 : To view the attachments of any specific email, select the mail and click on the Attachments option to view them. 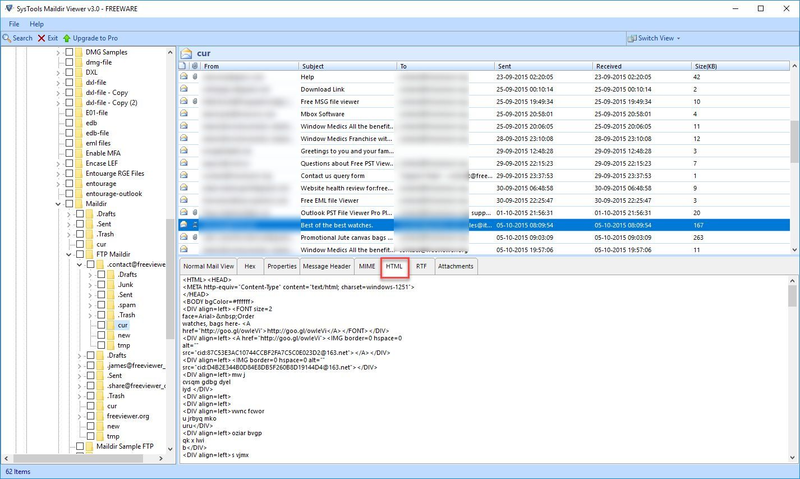 Step 7 : For viewing Maildir emails in Hex Format, click on Hex View option on Maildir Viewer tool. Step 8 : You can view the message properties like received date, email address, sent date, etc., by clicking on the Properties View tab. Step 9 : For Header Details like: To, From, Subject, Delivery Date, Content-Type etc., hit a mouse click on Message Header tab. Step 10 : To view the MIME Version and all other related details, choose MIME option. Step 11 : Get the HTML description of the message by clicking on HTML tab. Step 12 : Now, click on File >> Exit for closing the Maildir file viewer. Step 12 : Click Yes button to confirm exit. Q. Is there any specific Maildir file or folder size defined for reading Maildir file? Ans: No, there is no such specific file size limitation for viewing data with this freeware. You can open and view Maildir file or folder of any size and number without paying any cost for it. Q. A Maildir file is created by Mozilla Thunderbird. Does this tool gives supports to open this file? Ans: Yes, the Maildir Viewer Windows software will support to open Mozilla Thunderbird Maildir files. Our product also supports the server Maildir and Maildir++ files also. Q. Will there be requirement of any supportive application to work with your tool? Ans: No, you just need to download and install this free application on your system. After this simply open Maildir file to view entire content of it. Q. Is this Maildir Reader software secure on my computer? Ans: Yes, this application is totally safe and secure. This will not make any disturbance in normal working of your computer and you can trust over this freeware application. Note: Maildir Viewer Freeware COnverter Software will get delivered on your registered email id, within few minutes after placing the order. Maildir Viewer Windows is a peerless product that comes up with many advanced features. I have viewed many Maildir++ files with the help of this utility. The best thing I liked about the tool is that it has a very simple interface and anyone can access it without any trouble. Its horizontal and vertical viewing modes with Hex, message header, MIME, HTML, RTF mail, etc., tabs are awesome creation. I would like to say a big thanks to the entire development team for inventing such an awesome application. I got tired of searching for a procedure to explore Maildir++ folder files. Luckily, I got this impeccable utility. Data security is the major point of concern for me. However, the software ensured me this safety and helped me a lot in viewing every sized Maildir++ files. It was amazing to work with this software. I have completed the entire task within few clicks without any difficulty. Applauds! One of the best thing I liked about Maildir viewer Windows software is that it is independent from any kind of platform. I can efficiently use this application and that too in free of cost. No additional charges are required to be paid for this software. It just need a single download and then can be accessed without any complication to open Maildir Thunderbird files in bulk as well. I want to say thanks to its developer team for creating such a matchless utility.